Mysterious ways often describe the Almighty’s graces in our lives. Sometimes, spiritual guidance is sent in the form of influence to a person, who sees another in need of sympathy. To offer something to lighten up the emotional burden of his fellow man. A few days ago, such messenger came through in the body of an inspiring blogger of ajaytao2010 whose photographs and quotes exemplify hope. What better way to uplift my sagging spirits than be nominated for this very peaceful award. For his gesture, I accept and oblige. I send him my sincerest thanks and best wishes. 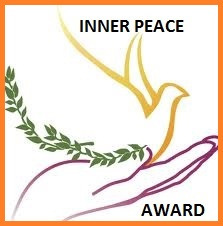 Feel free to accept the Inner Peace Award and add it on your blog. There is just one rule: when you pass the award on, please share some kind words with that person. No restrictions has been imposed by Summer, who constituted this award. gratz on this award 🙂 love your blog. Awwwwwwwwwww Sweet! Love this. Congrats and thank you for thinking of me. I will accept too. Just signed in. 🙂 Thank you for all the inspiration.